Spinach, bacon and cherry tomatoes give this chicken and pasta toss great flavor—and gorgeous color. Bonus: It's a quick and easy weeknight dish. Cook noodles as directed on package. Drain, reserving 1/2 cup of the cooking water. Meanwhile, heat dressing in large skillet on medium heat. Add chicken; cook and stir 5 to 7 min. or until cooked through. Add tomatoes; cook 1 min., stirring occasionally. Stir in noodles and reserved 1/2 cup cooking water. Remove from heat. Add spinach, 1/2 cup of the cheese and the bacon; toss lightly to combine. Sprinkle with remaining 1/2 cup cheese. Save 40 calories and 5 grams of fat per serving by preparing with KRAFT Light Zesty Italian Dressing and KRAFT Shredded Low-Moisture Part-Skim Mozzarella Cheese. 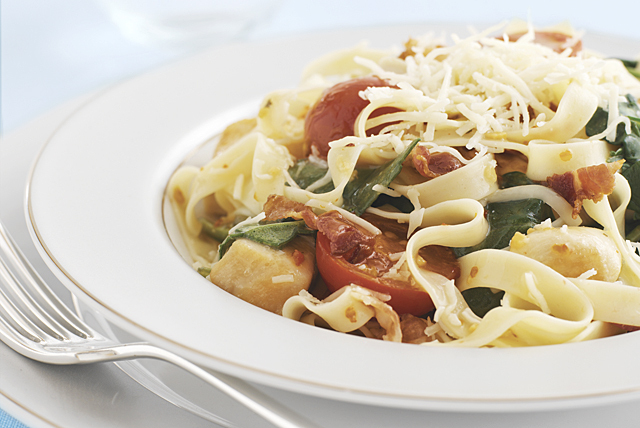 Try our healthy living version of Spinach and Bacon Pasta Toss. Spinach can hold a lot of dirt and must be thoroughly washed before using. To clean, fill a large bowl with water, then swish spinach around in water until most of the dirt comes off. Repeat process 2 or 3 times, using clean water each time, until no more dirt clings to the spinach. Rinse thoroughly under running water and remove hard stems. Spin dry in salad spinner and/or pat dry with paper towels. Use immediately or store in refrigerator up to 4 days. Use any variety of pasta including whole wheat pasta to make this fresh and flavorful dish.